Potty training usually begins with puppies. Unfortunately, there are a lot of dogs who do not know yet where and when it is appropriate to poop. While housetraining has been popular for years, many people still have dogs that are not housetrained. The main advantage of being housetrained is that you could trust your dog not to make your house his large comfort room. 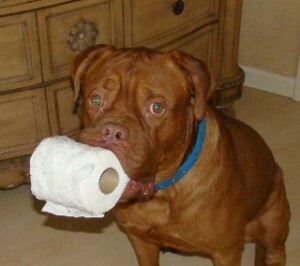 Not all dogs are ready for training and you cannot subject them to potty training at all times. The best time to correct misbehavior when it comes to potty is right after he poops. 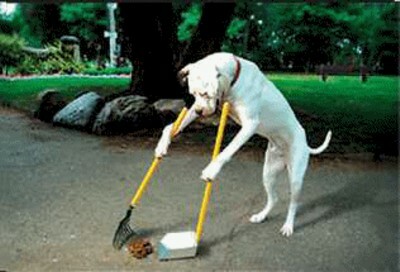 If you see the dog pooping, get his attention immediately and encourage him to continue outside. Give a command that will signal him to stop, ensure to it that the tone of your voice is low. After which, start introducing him with the command "outside" while guiding him gently to go outside towards a specific location where he is allowed to eliminate regularly. Most of the time, owners just discover the accident indoors and did not see the act. In this case, it is best to ignore the incident and wait for the next occasion the dog poops. Never rub his nose in it as this would not give him the proper lesson. Instead, if you could make the dog come to the area you could scold the poop in his front instead of messing up his nose with it. Why? Because even if only several moments have passed, he would never be able to make a correlation between the action he did and the scolding. If he is chewing a bone for example, and you scold him for pooping inside the house earlier, he would think that he is being scolded for chewing the bone not for eliminating indoors. There are instances when the owner sees the dog eliminating indoors and was ordered to go outside and came back in and continued pooping. Again, in this case, the puppy has done nothing wrong. He does not know what the owner wants to communicate by going outside. If you want the dog to accomplish as you say, you should have the patience to accompany him outside and teach him further. This could be made easier by using a leash for better control of the dog. Training, in general, makes use of commands which are effective tool to communicate with the dog. However the main problem in here is the use of the words. What people don’t understand is that the dog simply can't comprehend the meanings of the words if not introduced to him well. So in dog potty training, the trainer has to introduce the meaning of the commands well in order to gain some good results. For example, you could begin with the word "outside" to send him the signal that he should go outside. Then it could be followed by the words "go potty" to make him understand that it is time to eliminate. Whatever he does after, never fail to praise him (in acknowledgement of a favorable behavior) or punish him for failing to follow the commands. Doing this process repetitively will condition his thinking that when you say the words "outside" and "go potty" you want him to go out of the house to poop.